Close up face of a surgeon doctor working. Serious mature doctor with medical mask. Bright abstract blurred windows background with view on city. Doctor's hand push syringe ready to inject. 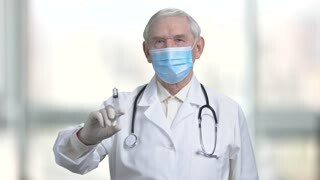 Old doctor wearing protective mask and stethoscope and put syringe in the air. Blurred windows background. Doctor with syringe is preparing for injection. Holding and pressing medical injection syringe and stethoscope. Dripping. Blurred city view from window background. Senior man with stethoscope wearing mask. Aged grandpa doctor put on blue medical mask in bright blurred windows background. Serious doctor in mask put on gloves. Getting ready to surgery operation. Bright abstract blurred windows background with view on city.